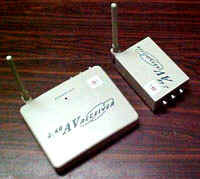 After years of sourcing and testing on numerous wireless video and audio transmitter we have finally settle for AVS 2.4. This wireless receiver and transmitter are useful in situation where laying of video and audio cable is impossible or in covert operation. Furthermore AVS 2.4 operate on Colour and B/W camera with audio. As this product is IDA approved and operate on the approved 2.4Ghz frequency it is 100% legal for use in Singapore, UK and most of Europe. They offer excellent picture quality and approx 150 meters in ideal conditions. When this system is install in building the operating distance is between 50 to 100 meters. They can work to a greater distance. To purchase the above equipment please call or e-mail to sales@secureciti.com or contact Securitex Electronic System Engineering. Our sales personnel will get back to you.